Once again, I am on the road on to another business trip. This time around to Boston, MA, to attend and present at *the* Enterprise 2.0 event of events. Of course, I am referring to the Enterprise 2.0 Event, a.k.a. #e2conf. So over the next few days you will see how this blog, once again, is going to go a bit dormant, as I doubt I would have some spare time to keep writing some articles; you know how it goes for these kinds of live events, face to face social networking will trump all attempts and efforts to go virtual this week, at least, for me, so I think I’d rather focus on attempting plenty of live tweeting while the event takes place, reporting further on the various sessions I will be attending, and then on my way back home, and seeing how I don’t have any other business trip coming up any time soon I will do a proper catch up on the blog about the event posting another series of highlights entries. But, for now, I thought I would go ahead and leave you folks with that other article from the series of the Social Business Forum event that took place in Milan a few days ago, and which I was due one last update. The remaining breakout speaker sessions and one final keynote. Thus let’s go ahead with it. Let’s do it! After the break from the first initial round of keynotes, the breakout sessions got kicked off into three different tracks: Employee Empowerment, Customer Engagement and Open Innovation. Obviously, I couldn’t attend all of them, since I had a couple of customer commitments and press interviews I had to attend to, but from the ones I attended I learned a great deal of new and interesting sites and thought I would go ahead and share those over here. For the remaining sessions you will probably have to wait for the recordings to become available to get a glimpse of how they went. I, too, would be looking forward to those! Overall, quite an interesting session and a very nice job well done by Phillip, specially, when he mentioned that one of the key elements from collaborating effectively was to make it fun and I couldn’t have agreed more wholeheartedly with him on that argument. It’s the fun part of work what makes work worth while, not only, because of the huge potential of facilitating better relationships and connections with fellow peers helping increase trust levels and social capital, but also because fun@work should always be the main trait from any social business out there; the alternative, as we have seen over the course of decades is rather ugly and should be avoided at all times. It’s now a good time to realise that not doing that is just basically helping us all waste more than one third of our lives not having fun and that’s something that I am not sure about you folks, but I wouldn’t feel comfortable with it. At all. Why neglect, when you could embrace it fully and get the most out of it? The next breakout session that I attended was conducted by my good friend Cordelia Krooss, who spent a few minutes talking about one of my favourite customers, BASF, describing their fascinating journey of becoming a social business with “Connect.BASF. The Online Business Network“. Indeed, to date, the BASF story continues to remain one of the most inspiring out there, because it details a few things that most social businesses need to realise in order to embrace such social transformation. 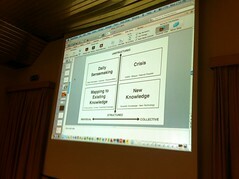 As a starting point, the fact you no longer need to be in the IT industry to become a fully integrated social business. the BASF folks have done it; in fact, just recently, they celebrated their first anniversary from when connect.BASF was born and still going rather strong. Secondly, they continue to prove how becoming a social business is a task that involves every single part of the organisation. Not just the IT department, or Marketing, Communications or HR. It involves all of them. It involves a new kind of leadership where you inspire changes to take place in order to provoke such social transformation from your entire business by empowering every single business unit of your organisation ensuring they all share that co-responsibility of wanting to make things right, which, in my opinion is as good as it gets and why I keep saying that Social Business is not owned by anyone, but by everyone, in equal parts, sharing the same responsibility of wanting to make a difference and drive that change. From there onwards, the next breakout session I attended, at least, half way through before I had to deal with some press interviews duties, was one I was really looking forward to as well, specially, since it was coming from one of the folks from whom I have learned the most, over the course of the years, around the topic of Learning & unLearning (Social Learning, even) and that we, finally, had the chance of meeting up face to face after all of these years following each other on the blogs and tweets. Yes, that inspiring speaker, and good friend was George Siemens who talked about the topic of “Analytics in knowledge and learning“. Then it was the turn to tune into one of the most interesting panels I have seen in a long while. This time around with Bertrand Duperrin, Keith Swenson & Mark Tamis on the topic of “Exceptions are not exceptional. Organizing for Unpredictability”, where they engaged with the audience on a fascinating conversation on the topic of Social Business and Adaptive Case Management, which reminded me of this absolutely masterpiece on ACM by the always rather resourceful John Tropea. I would need to come back and revisit this particular topic on ACM and how it relates to Social Business, but I can surely tell you that I thoroughly enjoyed the various connections made around the topic of social business and how much it relates to business processes, unpredictability, embracing of failure, just as much as success, knowing and embracing your limitations, delighting your customers, etc. etc. Lots of meat on this one to digest further. Watch out for the recording whenever it comes out! 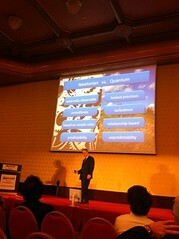 And, finally, the last session that I attended at the Social Business Forum was that keynote session from Keith Swenson where he talked about “Enabling quantum organizations as a new level of effectiveness“, where he introduced a new kind of organisation under the concept of “Quantum Orgs” that I can surely relate to big time! He defines them as orgs dominated by the “Pull” model, vs. the “Push” model from previous decades. 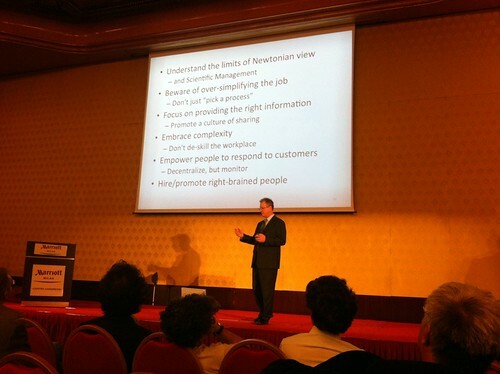 Once again, Newton came up (See Slide #7) to help reintroduce the topic of how we are moving from Newtonian Orgs. to Quantum Orgs (Slide #13 displays a beautiful comparison chart that is worth while every single word!). And that would be it, for me, folks, for now; hope you have enjoyed this series of highlights blog posts that I have put together for the Social Business Forum event that took place in Milan on June 8th and there is still one more entry to come along, which is the one where I will point you all to the links for the recordings of the various presentations, so that you can replay them all at your leisure. Hope you have enjoyed the ride reading through these just as much as I did attending the event. And, for now, get ready to take a short break of a couple of days and come back again, as I get on my way through the Enterprise 2.0 Conference in Boston to capture plenty more new insights, key learnings, new relationships, continue to nurture good old ones and a whole bunch of other stuff. The vibe is pretty good so far. The conference will be *even* better … And I will be more than happy to share further thoughts on it for those folks who may not have been able to make it this time around! Thus stay tuned for more to come along shortly … and, once again, a special Thanks! 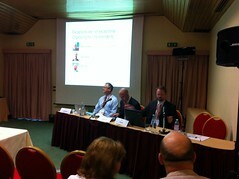 to the Open-Knowledge folks for their kind invitation to the Social Business Forum event! I’ll see you all next year! IBM’s Social Computing Guidelines – Now Updated! thanks a lot for this detailed summary of the event. 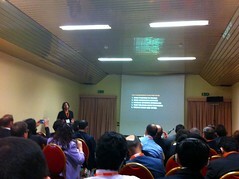 I was able to attend only part of it (since I’m based in Milan I had to cope with some routine business meetings…). Interesting post … quite agree with the idea of the quantum org, though i would say that this kind of imprecision is anyway a part of the business environment, though it is only now that this is coming up. Probably one of the things managers, trained in classical management principles, try to do is to fit the quantum ideas into Newtonian form. Hi Atul! Thanks a bunch for dropping by and for the feedback comments! Amen to that last quote on the role of classical management principles and how they transform chaotic, quantum ideas into something they can grasp and come to terms with in a Newtonian manner. Certainly, fitting quite nicely with today’s blog post, where I talk about a new kind of leadership, or radical management that certainly seems to be very fitting for quantum orgs! Good stuff!